The term homo ludens determines that human beings are essentially creatures who like to play. As a popular cultural product, games as well as their supporting devices have become inseparable from our daily lives. Now, in accordance with the growth and development of modern technology, the ecosystem of games in Indonesia is moving towards industrialization. Embraced and loved by people of all ages, the game business shows very promising potential. Even though games that could be played on Nintendo, Sega and Sony consoles have been consumed by the general public since the 1980s, the emergence of game developers coming from Indonesia could only be seen in 1999 when Matahari Studios became the country’s first local game developer. Hiring local talents for creating new games, Matahari Studio produced many games from other countries (such as the game “Need for Speed” for Electronic Arts). Since the foundation of Matahari Studios, more and more local game developers followed suit. Later on, during the early 2000s, online games and game publishers gained more ground. As companies or individuals holding the exclusive right to publish or distribute specific games, the only material that was available at the time was still dominated by products made abroad. One online game that rocked the Indonesian public at that time was Ragnarok Online, a creation of Gravity Corporation. PT Lyto Datarindo Fortuna became the Indonesian company that published the games of the company that had its headquarters in South Korea. These were the forerunners of the Indonesian gaming industry. The biggest challenge at the time was to develop a game with one’s own copyright. Even though there were now more than a few talented developers who wanted to conquer the world of games, the costs of developing one’s own game remained relatively high. In the mid 2000s, a number of local game developers emerged, following in the footsteps of Matahari Studios - however, they were still dependent on orders from other countries. During that time, flash games dominated the market, and continued to do so until 2011. 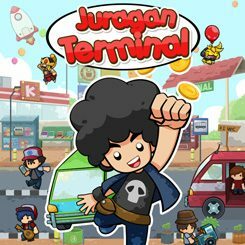 Foto (detail): Game, Juragan Terminal | © Own Games & Agate Studio As time progressed and technology developed further, business opportunities grew. Game developers with their own copyright became a more common sight, in accordance with the growth of smartphone users worldwide. In 2009, Agate Studio was established in Bandung, and in the years between 2010 and 2015, the Indonesian government through the Ministry of Tourism and Creative Economies supported the development of the game industry at various events. In 2012, the event “Indonesia Bermain” was held for the first time, followed by the formation of the Indonesian Game Association (AGI) in 2013. An Indonesian game rating system was established in June 2016, while August 8 has been officially announced as Indonesian Game Day. To keep up with the times, a number of educational institutions in Indonesia have established information technology departments with a specialization on game development - which is very supportive of the existence and further development of the gaming world. From a market perspective, it can be said that the biggest potential in Indonesia lies in the huge number of social media and smartphone users. Although it hasn’t reached the same level as other countries like Japan, South Korea or the US, where games are both produced and consumed, the gaming ecosystem in Indonesia is growing fast and steady. Besides the many gaming communities that are emerging like mushrooms in the rainy season, there are also a lot of creative ideas to go around. Specific events that appreciate, celebrate and develop the local gaming ecosystem are also growing in numbers, like the Indonesia Game Show, the Game Development Gathering and Popcon Asia. By getting closer to forming an industry, the gaming ecosystem in Indonesia still faces various challenges. Although the number of local game creations is rising, games from abroad still dominate the market share. Regarded as creators with typically local content, Indonesia itself is still considered as potential market and subcontractor. Indonesia has great potential to form a whole and complete gaming industry. With relatively low costs to make a game - at least, compared to other countries - we have the necessary human resources and a high level of creativity, whereas many Internet and smartphone users can be empowered as casual game players. Game: Football Saga | © Agate Studio Essentially, what is still needed is a collaboration between the whole field of digital gaming and other media such as comics, animation, board games, card games, merchandise, films, e-commerce, fashion, music and others. Only through collaborations can the Indonesian gaming ecosystem advance, coming closer to having a real game industry. It is not an easy task and indeed a big challenge, but it is also not impossible… and now is the right time to start creating networks and fruitful collaborations that will help the Indonesian game industry to move forward, now and in the future.